Barnaby on stage, version 2. After a failed stage adaptation and one failed radio version, Crockett Johnson’s Barnaby headed for the stage a second time. 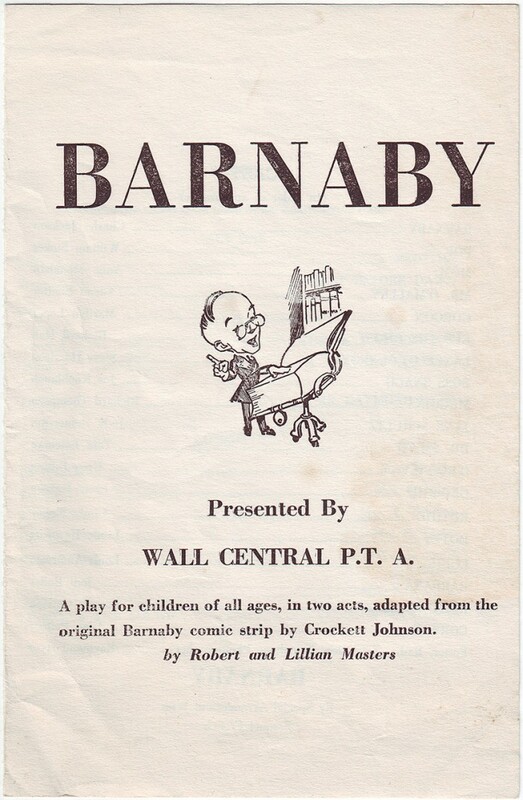 Adapted for children’s theatre by Robert and Lilian Masters, this Barnaby made its debut in Terre Haute, Indiana, in May 1948. 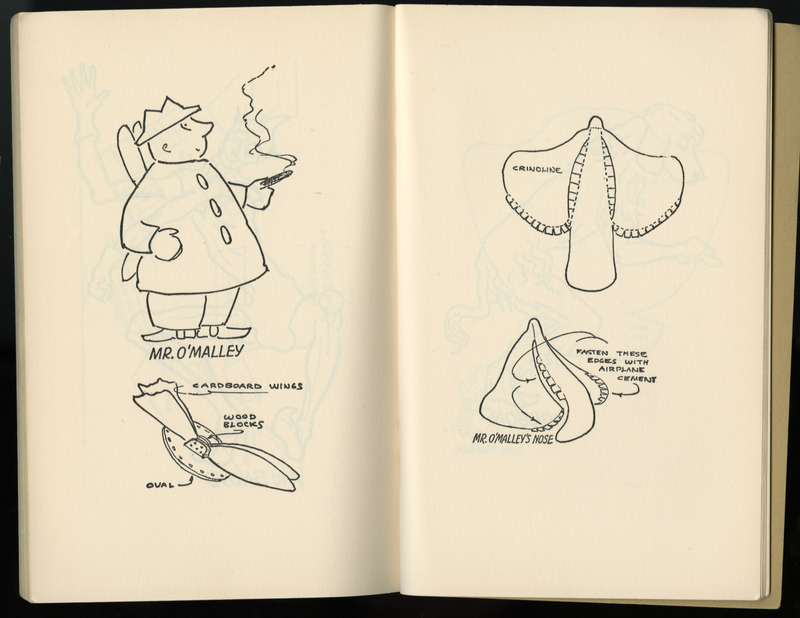 Looking ahead to the publication (in February 2013, I am told) of The Complete Barnaby, Vol. 1: 1942-1943, here is the story of that play, featuring a few images from the script (published by Samuel French, 1950) and a program from a production at the Wall Central School in the 1950s. Courtesy of Mark Newgarden, here’s a program from the Wall Central P.T.A.’s production, presumably presented at the Wall Central Elementary School, in New Jersey. (The program offers no info. about the state in which the school is located, but there is a Wall Central School in NJ, and mark bought the program in NJ.) The cover image seems to be a sort of “stock” image. Presumably, a guy reading from an unabridged dictionary conveyed “drama” to the person assembling the program. Or maybe this was all they had on hand. 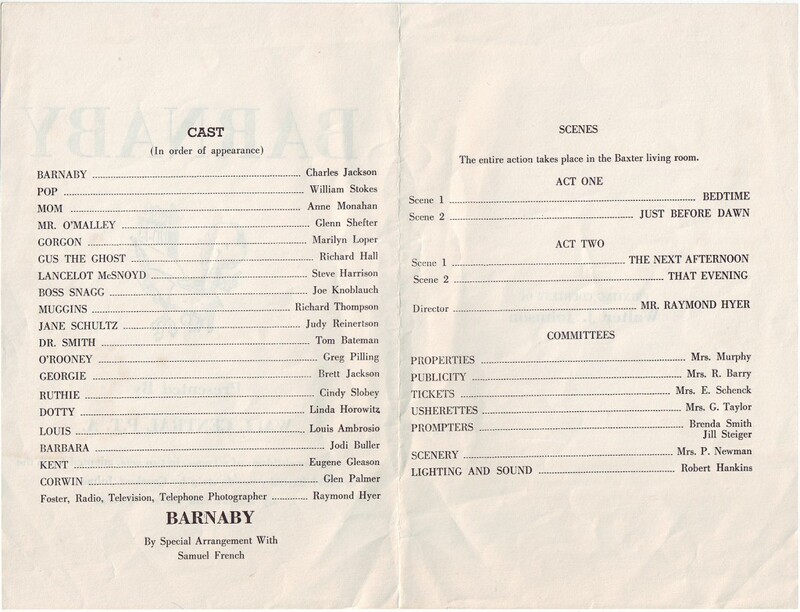 Below, the inside of the program, where we can see the cast of this show. Anyone from New Jersey recognize any names? Any sense of a year? Mark Newgarden thinks that it’s from the 1950s, and that sounds about right to me. 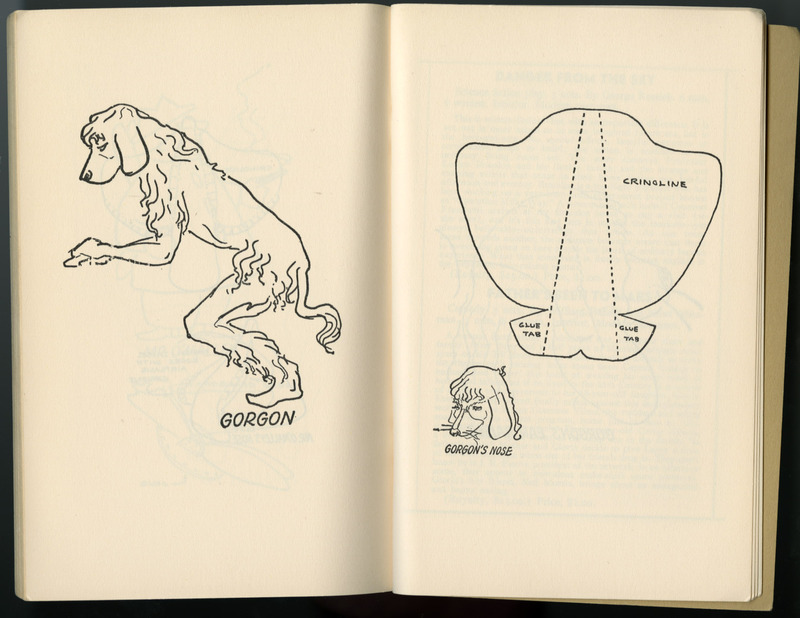 Perhaps wary of working on another adaptation of his comic (he felt he was insufficiently consulted on the earlier stage version), Johnson left this one entirely to Robert and Lillian Masters. He sold them the rights for $1.00, plus the promise of fifty per cent of any profit they might make from sales or performances of the play. All too aware of the complications of trying to shape a stage Barnaby, Johnson otherwise remained uninvolved. Thanks to Daniel Clowes, here are some… unusual drawings of the Barnaby characters, included in Robert and Lillian Masters’ script. And no, these are not by Crockett Johnson. The script does not identify the artist. The stark difference between this artist’s style and Johnson’s highlights the clean beauty of Johnson’s. Or, at least, when I look at these, I am struck by how “un-Johnson” they are. Incidentally, I have in the past week seen some of Dan Clowes’ layout and design for The Complete Barnaby Volume 1. I can’t share it with you on the blog (yet! ), but trust me: this is going to be a beautiful book. Cushlamochree! Barnaby on stage! 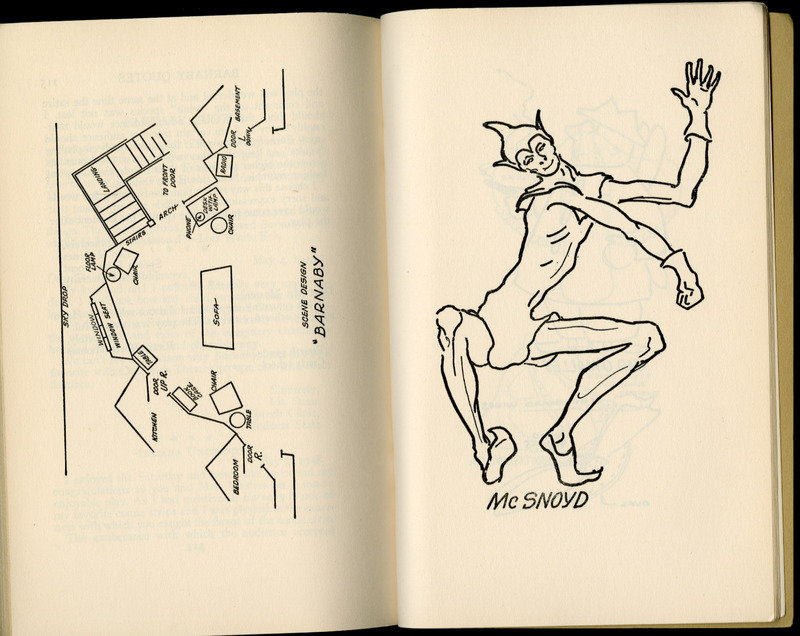 Some photos and images from Jerome Chodorov’s 1946 play. Barnaby on the radio. The 1945 radio adaptation, with full audio. Crockett Johnson and Ruth Krauss: biography outtakes, part 4. A few more thoughts on adaptations (cut from my biography, published earlier this year). Barnaby. In color. One of the Sunday strips. Merry Christmas from Mr. O’Malley. Another Sunday strip. Color Sunday Barnaby: March comes in like…. And another one. Here Comes the Barnaby Truck. Photo of a Chicago Sun truck featuring a Barnaby ad on the side. The Debut of Crockett Johnson’s Barnaby. Some ads for Barnaby. They ran in PM the week before the strip’s April 1942 debut. The Complete Barnaby: Coming Soon! An announcement for the publication of The Complete Barnaby Volume 1, which (I know) was supposed to be out by now. As noted above, at present it’s due in February 2013. If I could make it appear sooner, I would. Bonus: an advertisement for Barnaby (Holt, 1943). Happy Birthday, Crockett Johnson! Features an advertisement for Barnaby and Mr. O’Malley (Holt, 1944).